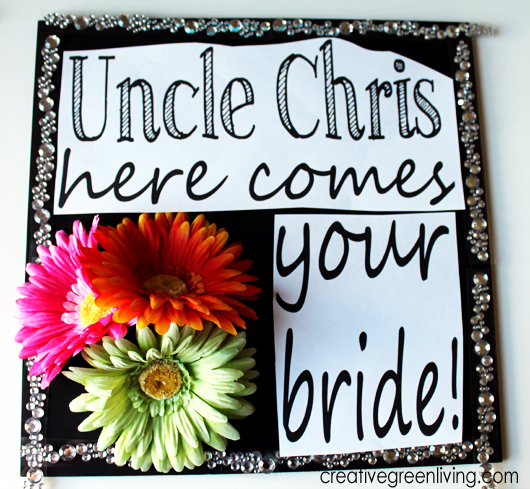 I love the "Black and Bright" wedding theme my brother and his fiance picked for their wedding. So in addition to loving the people getting married, I was so excited to be asked to craft for their upcoming nuptials because now I get to play with fun materials! In asking about the style she was looking for, the bride said she wasn't picky but she wanted it bright and sparkly - which I can definitely deliver on, especially with the David Tutera Bridal products at my disposal! Paint the top and edges of your board black. Allow to dry before painting the back. Check your layout of your board. I cut the rhinestone trim sticker sheet into strips so I could line them up with the flowers and text to make sure everything fit. 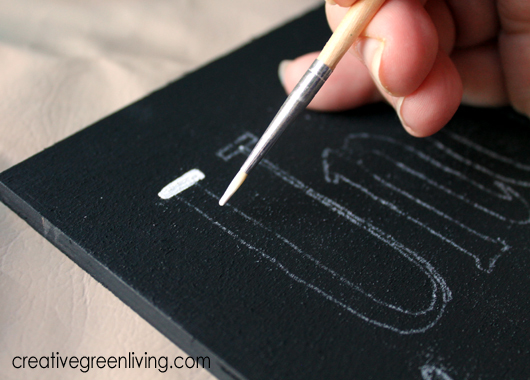 To transfer the letters to the board, lightly rub the long side of a piece of chalk on the back of the paper. Shake it off to remove any chunks and excess chalk dust. 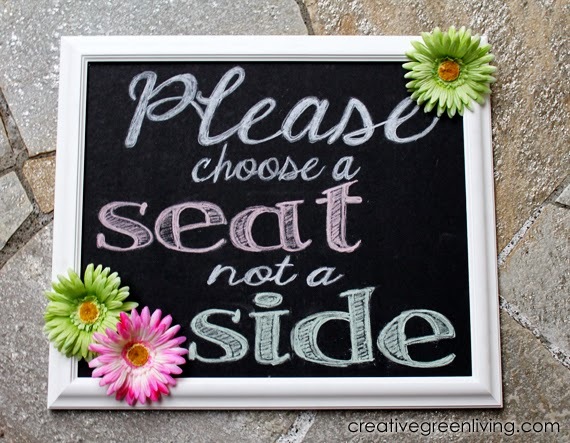 Place the lettering on the board, chalk side down, and tape the top edge to keep it in place. 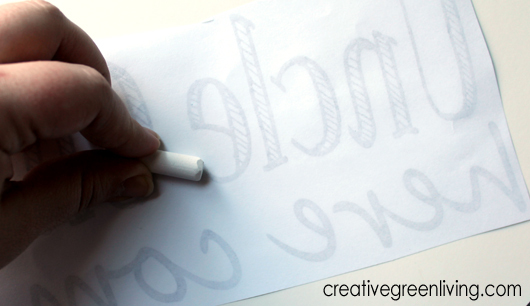 Using a ball point pen, trace the outline of your letters using medium pressure. 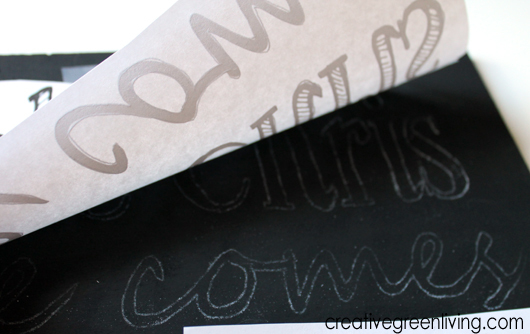 This will transfer a chalk outline of your letters onto your board in preparation for painting. Check your work to make sure the letters have completely transferred before removing the paper. 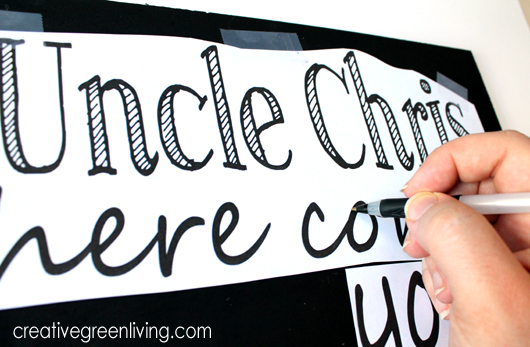 Once all of your letters are transferred, use your fine point paint brush and white paint to fill in the outlines. Go slowly and take your time. 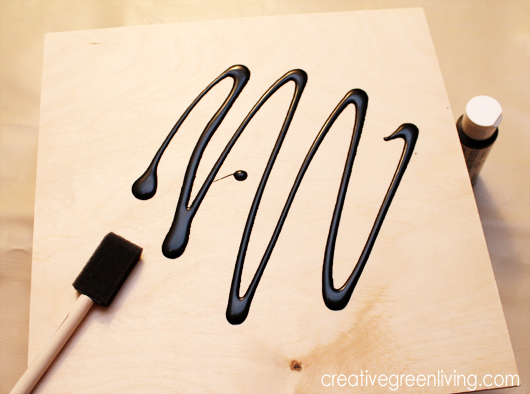 Once all the letters are painted, set it aside to dry. 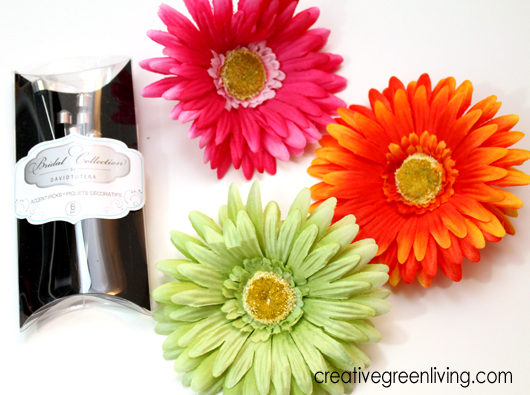 Pull three large daisies from their stems. 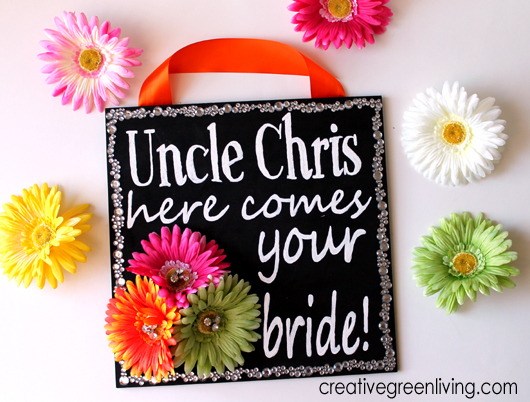 I used pink, orange and lime colored daisies to coordinate with the wedding colors. 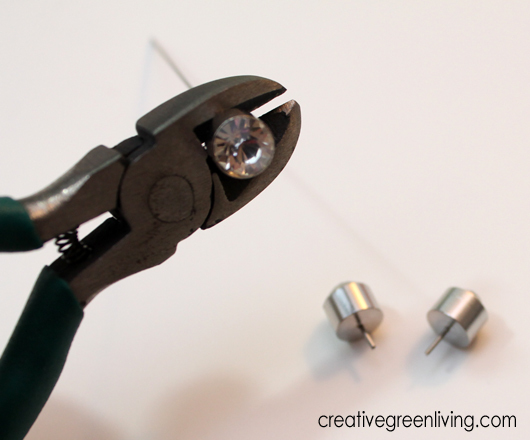 Use your wire cutters to snip the heads off of the floral picks leaving about a 1/4" tail. 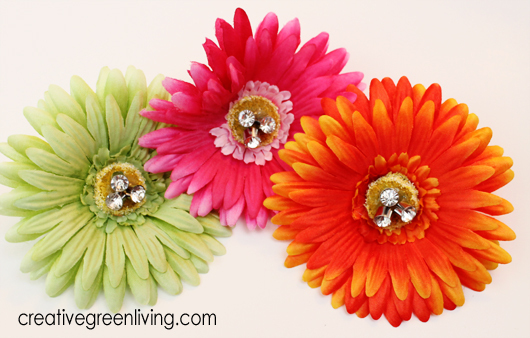 Use hot glue to adhere groups of three to the center of the flowers. Set aside until glue is completely set. 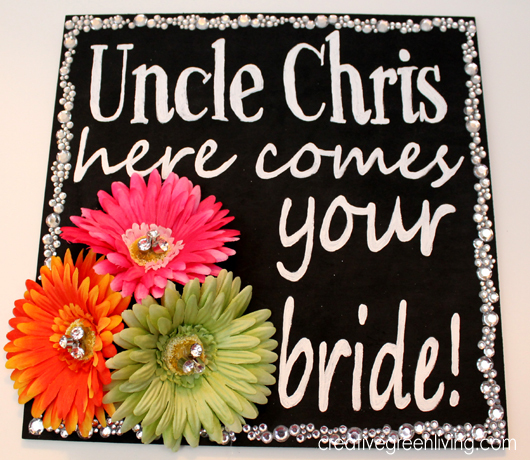 Gently peel the rhinestone trim from the backing and adhere around the border of the sign. 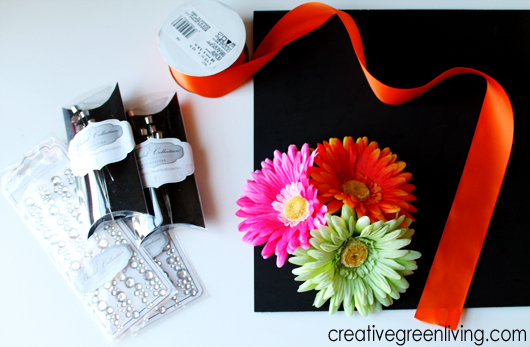 Once the border is fully installed, use hot glue to glue the flowers to the corner of the board. Set aside to allow to fully set. Cut a 15" length of ribbon. Fold the bottom edge up to hide the raw end. Use hot glue to secure the ribbon to the board. 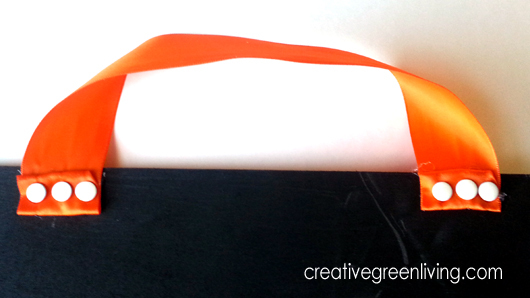 For extra reinforcement, push 3 thumbtacks through the ribbon on each side of the handle. 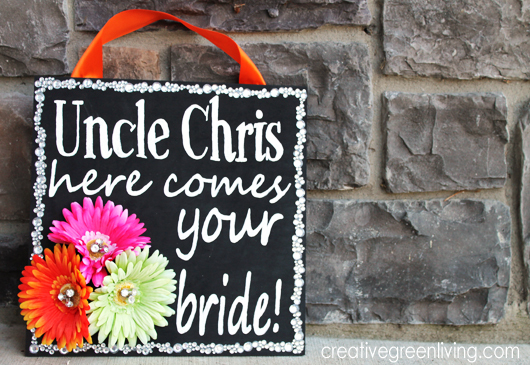 Use your sign to have a ring bearer or flower girl announce the bride's arrival in style. 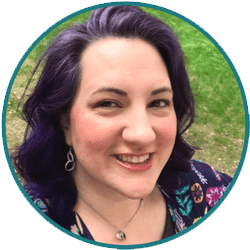 Disclosure: I wrote this post as part of a sponsored campaign with Darice and The Blueprint Social. Original project is my own creation. All photos, instructions, opinions and love of bright, sparkly things are my own. See my complete review policy here. I love this ~ so unique! Thanks for sharing. Love it Carissa! I particularly love the bright flowers against the black. SO pretty! You are Brilliant! Love it! 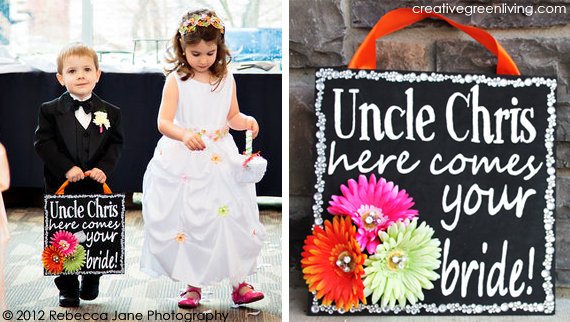 I would have never thought of the chalk idea. This is so adorable! Great idea! And thanks for the tip about using chalk. 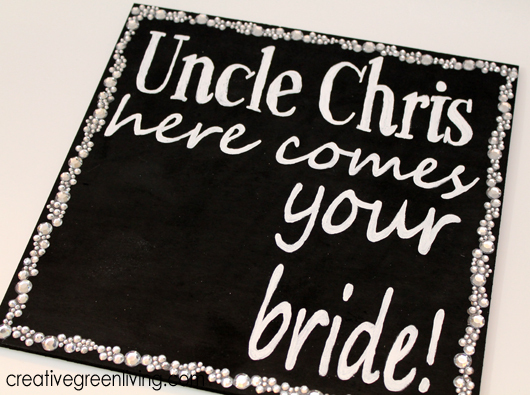 Such a cute sign and that's a brilliant transferring method ... I pinned that! Gorgeous! 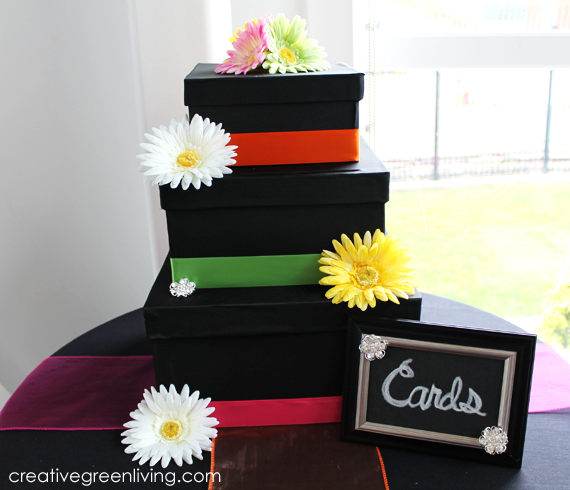 Love the bright colored gerber daisies! I have been looking all over Pinterest for a way to transfer onto dark wood. This is a life saver! I love it!!! 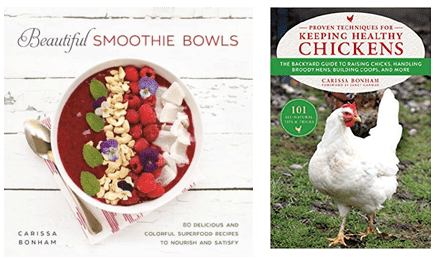 Can you tell me what fonts you used, please? Glad to help! 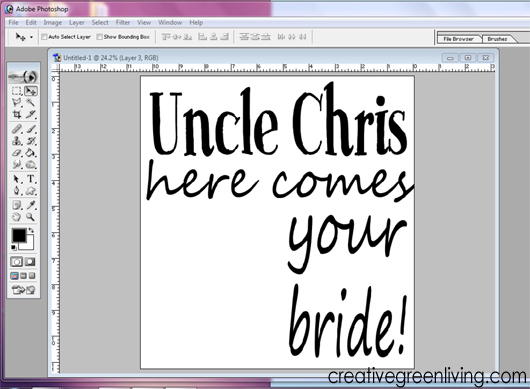 The "Uncle Chris" font is Sketch Serif. I'm not sure what the other font is. My harddrive crashed since creating this project so I no longer have the files. Sorry. I just printed it onto normal paper. Then follow the instructions in the tutorial for transferring the design to the board.